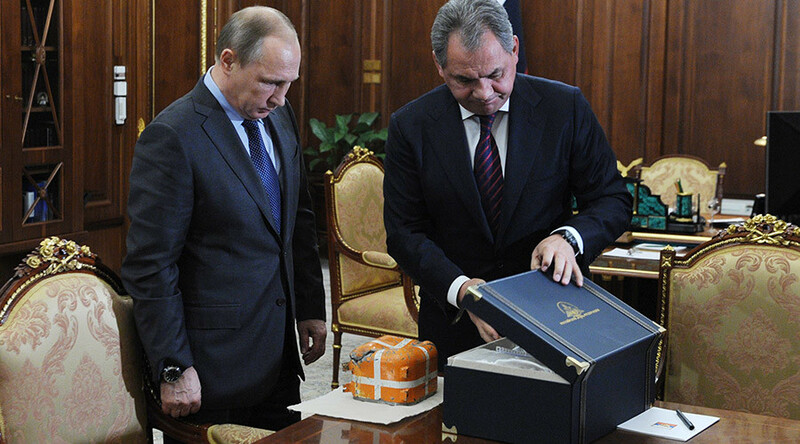 Russian Defense Minister Sergey Shoigu provided Russian President Vladimir Putin with the recovered flight recorder on Tuesday during their meeting in Moscow. Shoigu said that Russia has been actively conducting operations on Syrian territory, where the Russian Su-24 pilot was “gunned down” by Turkmen militants after he had ejected from the plane. “As a result of this work, these territories were liberated by the special operations forces and the Syrian army’s special force tasked with the crew search. Surveying the area, the Syrian military found the plane’s crash site,” he said. The militants, who “actively” fled the area, had no chance to dismantle anything which was among the debris from the plane, the minister added. The Russian leader emphasized that the parametric flight recorder should be opened and decoded only in the presence of international experts who are genuinely interested in finding out the truth about the incident. “But whatever we might learn will not change our attitude towards the deed by the Turkish authorities. We have considered Turkey not only a friendly country, but also as an ally in fight against terror, and no one expected such a despicable, treacherous stab in the back,” Putin added. Ankara claims it repeatedly warned the plane crew prior to the attack. However, the surviving Russian pilot, Konstantin Murakhtin, stated that neither he nor Lieutenant Colonel Oleg Peshkov had received any radio or visual warning.